Aug. 24, 2017 1:48 p.m. The fire burning in Joe Rich is now 40 hectares in size and burning out of control. BC Wildfire Service has an initial attack crew on the ground as well as air support, to assist local fire departments. There are structures in the vicinity by forestry says none are immediately threatened. A fire investigation team is on route to the scene to determine the cause of the blaze. The Central Okanagan Emergency Operations Centre says it has been activated to support fire crews fighting a spreading wildfire in the Joe Rich area. In a news release just issued it, it says an evacuation is underway for properties from Cardinal Creek Road to the eastern boundary of the Regional District. Properties east of Greystokes Road must evacuate via McCulloch Road. A detailed map will be available showing affected properties at www.cordemergency.ca. All properties west of Cardinal Creek Road are on evacuation alert and should be prepared to leave on short notice should conditions change. An Emergency Support Services reception centre is being established at Willow Park church on Highway 33 in Kelowna. It will be open to help residents starting at 5:00 pm. Highway 33 is closed at Cardinal Creek Road as ground and air crews are involved in fighting the blaze that was reported shortly after 1:30 this afternoon. New information will be released as soon as it becomes available. Central Okanagan East regional district director Patty Hanson says she is concerned about the lack of fire hydrants in the area for fire fighting, limited resources the fact that some drivers are still throwing cigarette butts out the windows of their vehicles. “It’s so dry out here,” said Hanson, at the scene of Thursday’s fire near Philpott Road. Hanson most of the people in the area get their water from wells. “There is a grave concern for the entire community,” she said. Another woman said she is concerned about a campground in the area and anyone who may be there. Rutland resident Tammy Kasper, who is also at the scene, said she is also very worried about and elderly friend who lives in the area close to the fire. She said the woman has mobility issues. “At this point I’m just really really worried about here,” said Kasper. She said she had not been able to contact her by phone yet. Meanwhile, there are reports a lone female hiker is possibly trapped one kilometre from Philpott Road on High Rim Trail. Firecrews are heading there to investigate. Some residents are concerned about their horses in the rural area where the fire is located. They are worried because they cannot get to their animals to lead them to safety. The wind is blowing strong in the area and there is a lot of smoke. The helicopters are now overhead. Traffic is being let out of the area as the evacuated residents leave. The fire is believed to be moving west. The Capital News has a reporter on site. An evacuation of the area around Philpott Road area is now underway, according to the fire department. Residents of the area are worried, traffic is backing up and there have been a number of near traffic accidents as people move out of the area. One man said he plans to just jump in his truck and get out of the area as quickly as possible. Emergency crews say they will have to evacuate the entire area around Philpott Road as the fire continues to grow. Described by one firefighter as a “massive” fire that will require the fire department to “throw everything we have it,” B.C. Wildfire crews and forestry crews are being called, in as well as air support. Highway 33 at Cardinal Creek is closed. Two helicopters and a fixed wing tanker are on their way. Emergency crews are responding to a bush fire on Highway 33 and Philpott Road near the community of Joe Rich just east of Kelowna. Early reports have a fire burning on both sides of Philpott Road and emergency crews are requesting air tanker assistance as well as RCMP who have been asked to possibly close Highway 33. Crews from the Kelowna and Joe Rich Fire Department are responding. 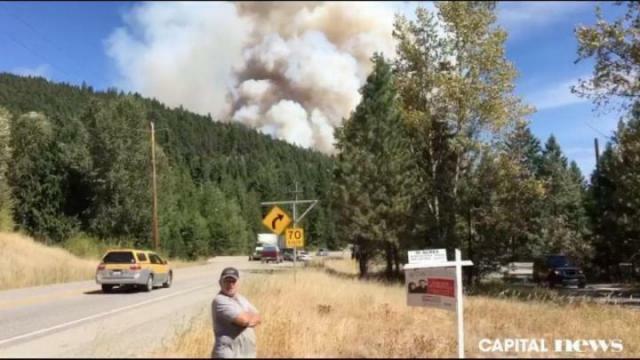 According to reports, the BC Wildfire Service has also been called in and there are indications that residents living along Philpott Road may need to be evacuated. The fire is said to be about 100 metres wide and 500 metres up the hill and moving fast. The Capital News has sent a reporter to the scene and we will provide more information as it becomes available. A bush fire has sparked on Philpott Road near Joe Rich.